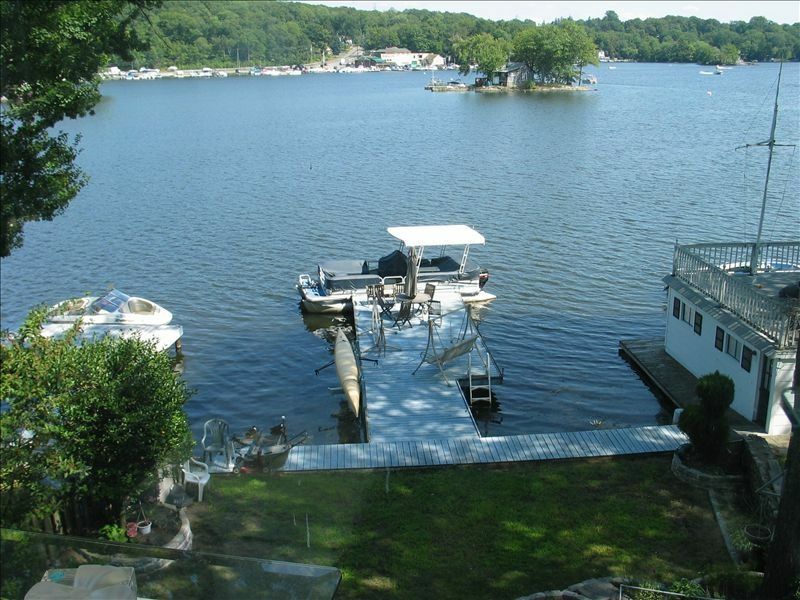 Magnificent Lakefront 4 BR/3.5BA House in Lake Hopatcong New Jersey. Attractive Non-Smoking four bedroom includes a master suite with cathedral ceilings and a 300 sq ft glass English Conservatory attached to the spacious living room for a spectacular view. This is a three story house, equipped with central air and oil heat with plenty of large windows. The house has plenty of parking for your convenience. Has beautiful wood floors throughout, a modern eat-in kitchen, and a gorgeous formal dinning room. Our goal is to provide our guests with a pleasant and relaxed vacation filled with great memories of the Lake, and to share the beautiful experience of our newly decorated home with designer furniture throughout which welcomes you to come back and visit again and again. This house is located in a great area of the lake with easy access to restaurants and shopping centers, but it needs some updating in critical areas. The basement (which has 1 bedroom, 1 bathroom, and the laundry room) has no A.C. vents and gets very hot at night. The basement is also very dry, and while there is a humidifier in the basement it does not help. Both my 9-month old daughter and I got nose bleeds one of the nights we were there. The home also has a lot of glass furniture and sculptures, so if you have young kids who are busy, you will need to move and hide many of these items. Overall the house offers a great view of the lake and easy access to restaurants, but could use updated duct work and the back yard needs some serious LTC. This home has major potential but needs some attention. The view was worth it !!! Sorry this review is late but I couldn't go without saying what a wonderful and relaxing time we had at this lakefront home. The owners Yang and Steve met us at the house and gave us a tour of their beautiful home with a 311 on all the amenities. The Lakeview home was beautiful and spacious to accommodate us and my guests. But most of all, the solarium was beautiful and the Lakeview was spectacular. They had a formal dining area but we spent most of our time in the solarium entertaining our friends and BBQing. We rented during the 4th of July holiday and we got an added treat with a spectacular firework display over the lake. We all had a great time and great memories. Thank you Steve and Yang. Robert and Yang were lovely hosts. They answered our emails and telephone calls quickly. The house was clean and spacious. My favorite room was the Sunroom. We rented in November, so It was a bit cold for us to go outside. This room was sunny and warm. The Lake was full of ducks, geese and swans one day. It was a beautiful sight to see. The house has a lot of natural light and the kitchen was equipped with everything you would need. We enjoyed our stay very much. We had a wonderful stay. If it was warmer outside it would’ve been even better for us to enjoy the deck and the beautiful lake view. We would definitely return. Very nice location, very nice house. Positives: the sun porch was the room to hang out in any time of day, providing beautiful views of the lake. Living space and bedrooms were very comfortable and we had plenty of room for everyone. The kitchen had everything a person could need. Not so good: the cleaning service left some bathrooms a little messy. The dish washer is loose in its space and there was a switch missing from one counter light, and may be a shock hazard. The dock was unusable due to goose droppings. Overall, the positives greatly exceeded to negatives and we would definitely stay here again. We had 8 ladies spend 3 nights at this lakeside property and it was perfect for us. We thoroughly enjoyed sitting on the dock with our adult beverages one evening and "dancing like no one was watching" in the living room/sun room another night. I wouldn't hesitate to go back to the property again. Rates from May to September is below. $1500 per weekend (Fri & Sat) $2450 per week (Friday to Friday or Sunday to Sunday) Other times: $1000 per weekend, $1800 per week Minimum stay can be for 2 nights if staying over the weekend.